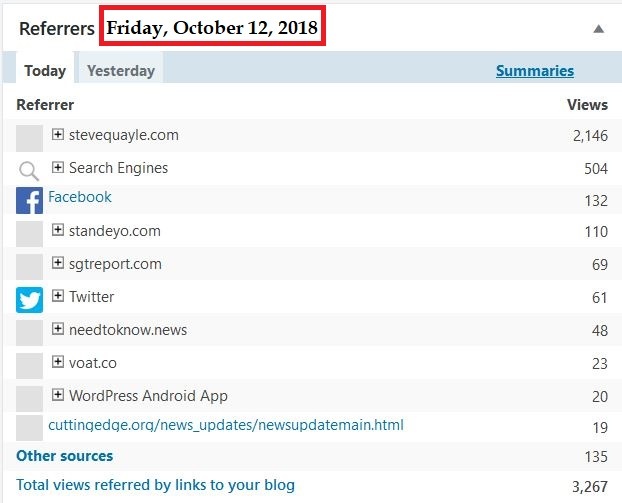 So I went to FOTM‘s stats page, only to discover that WordPress had changed the referrals of the day before, Oct. 11, to remove all referrals from Whatfinger! The problem is, a day before, I had seen thousands of referrals from Whatfiinger, which now had vanished, retroactively expunged by WordPress. What WordPress is doing is dishonest, deceptive, and plain evil. By shadow-banning referrals from Whatfinger, WordPress’ intention is to damage Whatfinger by alienating FOTM from Whatfinger. Well, WordPress, we are on to you and your evil doings. FOTM will continue to promote Whatfinger News. Despite your evil machinations, Whatfinger News will continue to thrive and hopefully overtake sold-out Drudge Report some day. Note: On August 15, 2018, WordPress arbitrarily and with no just cause, took down Fellowship of the Minds — the digital equivalent of burning down an entire library, of tens of thousands of blog-posts in nearly 9 years, many of which are the products of original research and genuine investigative journalism that the corporate MSM lackeys no longer undertake. Although FOTM is restored on another server, we use WordPress’ $99 Jetpack software because our readers are familiar with the format and features. 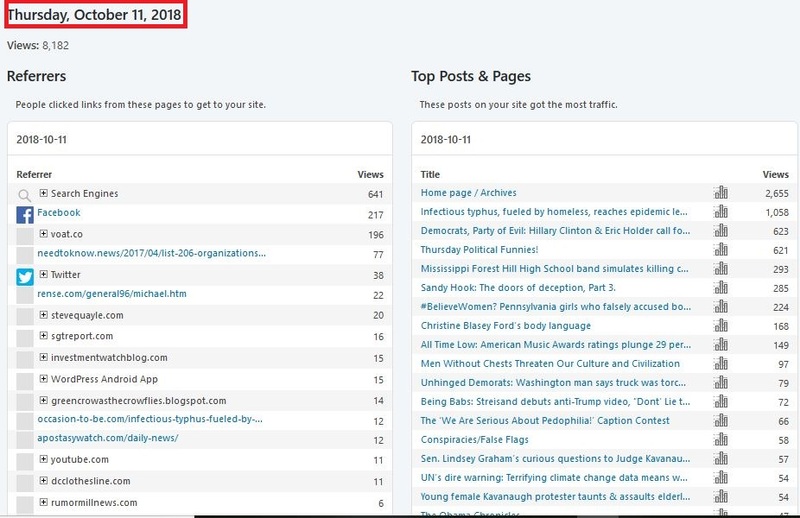 This entry was posted in conspiracy, Evil, Liberals/Democrats/Left, tech giants censorship, United States and tagged evil WordPress, shadow ban, Whatfinger News. Bookmark the permalink. WordPress is evil. I maintain a conservative website there so I understand exactly what you are talking about. Half the time on this site my ratings do not register, so know that your postings and comments are getting FAR more likes than actually appear. Related: Any information about Dr Fetzer’s site? Also: couldn’t “shadow banning” be considered a conspiracy in restraint of trade? The left wants to censor free speech. They only want to allow speech that they agree with. If you want to preserve our Constitution and free speech in this country, NEVER vote for a DemocRAT again. “There are now well-developed networks of Americans targeting other Americans with purposefully designed manipulations,” This was said with conservative ideas in mind….I wonder how it does not also apply to the liberals or anyone who would like to shape public policy? While this is detestable, it is also understandable. The CIA contributed greatly to the founding of these “social media platforms”. Why do you think they did that? I’ll make a wild guess. Could it be to control the narrative? By establishing control over widely-used portions of the internet they can control what bypasses the controlled TV and print media. It is closing in on the election season. They want to shut down any voices of reason that may be out there. People that know how to do so should be forming alternatives to these that are not under quasi-government control. Can’t have the plebs talking amongst themselves. 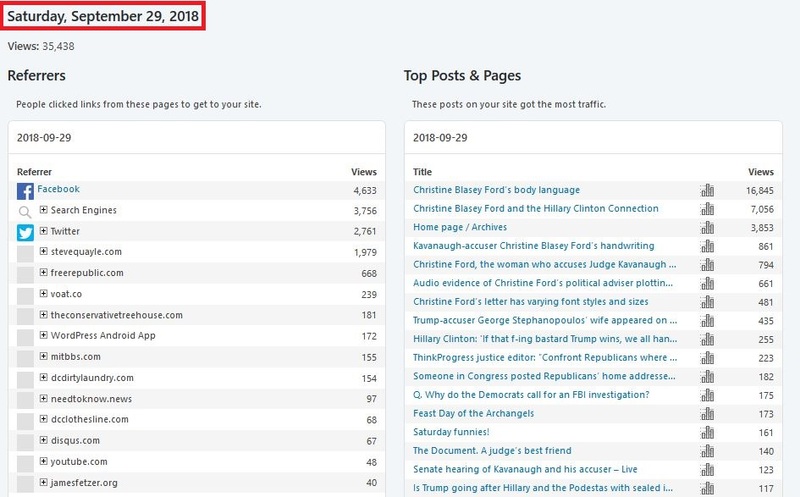 IF WORDPRESS WANTS TO JOIN FACEBOOK IN ATTACKING CONSERVATIVES, WE’LL JUST HAVE TO SWITCH TO AN ALTERNATIVE https://winningwp.com/alternatives-to-wordpress-compared/ !!! Fox News shadow bans commentors since liberdull Disney bought it. Suddenly, no thumbs up for comments of any sort. It’s obvious, but they don’t care. Both Brietbart and The Hill shadow ban me and I am a conservative. I no longer follow any of their stories, or go to their sites. This isn’t just liberals on conservatives. All these sites are money making operations and they will cut your throat. They have no commitment to anything, but drawing eyeballs and marketing the stats. wordpress is a failure from the start. WHY are people using it? Go to any web host, grab a domain name and a hosting account, install DRUPAL and make your own blog. No Problems. Strange this recent new attempt to silence and censor. Hope you can get to the bottom of it and do something about it. Where is your subscribe “button”?? WordPress.com sites are different from WordPress software. The simple solution is to use WordPress software to set up your own site with your own hosting company. And use independent tracking and analytics plugins. – Was your site hosted on WordPress servers when the problems occurred? Or were you using your own WordPress installation on your own server? – It appears that you reported statistics from WordPress in the article. What do server statistics show (e.g., Webalizer), and do they differ from statistics reported by WordPress? This is the litmus test that will reveal whether WordPress is doctoring their statistics. Not lecturing. However, as a web developer, I am trying to understand the issue in order to determine the exact nature of the problem so as to determine whether it applies to my clients. Again, when you refer to “our stats”, are you referring to WP stats, or to actual server stats? The advent of social media was adding a bit of sugar to lure people in so they will give up websites and many have. Now most websites either do not work or are no longer updated. This shadowbanning is just the start of worse things to come. 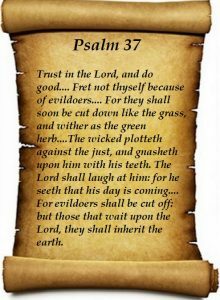 The bible makes it clear that NO FLESH will survive what’s to come if it weren’t for God speeding up the Tribulation. I also wonder if it’s your angel art at the top of the page being flagged offensive as if you are to be fair you have to have a Muslim artwork andmaybe Buddahism but then it will no longer be your site but their narrative!. it isn’t really anyway since your using their platform!